There are recipes that call attention to the cook, and then there are those that call attention to the ingredients. This recipe relies heavily on the latter, and thankfully so. Recipes that call attention to it’s ingredients mean that most of us can turn out wonderful meals, our culinary skill set notwithstanding. 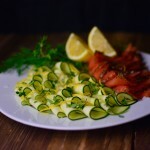 The triumph of this particular recipe relies on several ingredients; the freshest zucchini you can find, preferably organic; the best olive oil you can find, preferably cold-pressed and organic; the best sharp and firm cheese available to you, and the freshest lemons and herbs available to you. Of course this isn’t truly carpaccio since it’s not made from meat or fish, but rather zucchini. And though its not authentic it is authentically good. Especially, if like me, you crave new ways of enjoying fresh vegetables other than the usual leafy green salad. At one of my local fishmongers I saw a beautiful display of several cured and thinly sliced filets of salmon. Some were smoked, cured with paprika or black pepper. The filet that caught my eye was “sun cured” and seasoned with herbs and lemon zest. I bought the remaining slices from the filet and thought that this method of zucchini would go wonderfully with my “sun cured” find. I started off by slicing my zucchini as thinly as possible. I used a mandoline set on the thinest setting possible, which ensured paper thin slices of zucchini. However, a sharp knife and a steady hand or a wide-blade vegetable peeler could work as appropriate substitutes. I then proceeded to lay the slices on my plate in wave-like curls. Then, I scattered the lemon zest, fresh herbs, shaved Parmesan and sea salt onto the zucchini and drizzled onto it some olive oil and lemon juice. Start by slicing the zucchini into paper-thin slices. I used a mandoline and cut the zucchini on the bias, which gave me longer slices to work with. You can also use a really sharp knife and a slow, steady hand to get thin cuts. 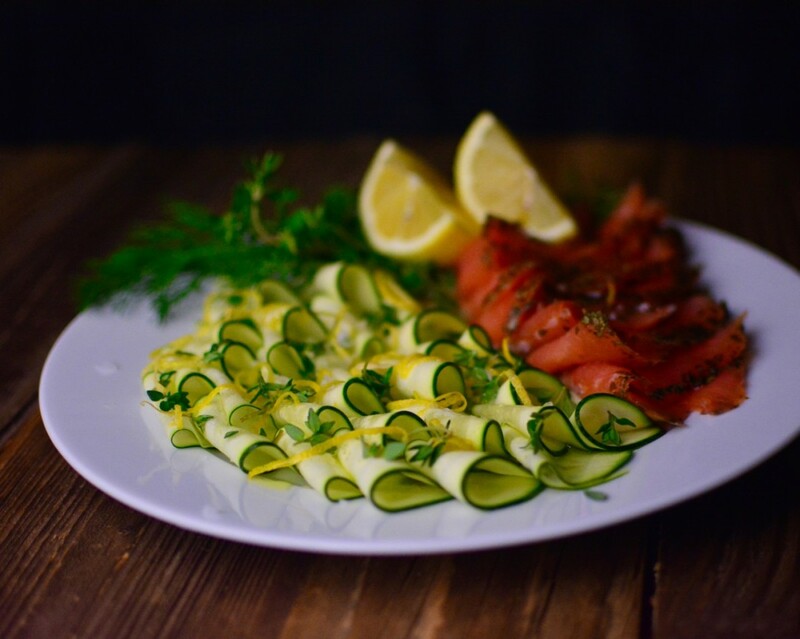 Arrange the zucchini onto your plate or platter as you wish. This is where my longer slices were helpful, as they allowed me to curl and overlap my zucchini onto each other. Then, scatter the lemon zests, fresh herbs, Parmesan onto the zucchini. Sprinkle with sea salt and pepper. Next, drizzle with olive oil and a squeeze of lemon. Serve immediately. I serves this alongside cured salmon. Alternatively, consider serving this with fresh olives, additional cheeses or marinated sun-dried tomatoes.